Sergeant James Ensor, 1512552, 100 Squadron, Royal Air Force Volunteer Reserve. James Ensor was born in Nuneaton, Warwickshire in the summer of 1921, the only son of wood turner Ernest James Ensor and Martha (nee Jackson) who had married in Nuneaton in 1912. On the 11th March 1944 at the Methodist Church on Wesley Street, Ossett, 22 year old bachelor James Ensor married 18 year-old spinster Margaret Minifred Jelly, who was born in Birmingham in 1925. James, a sergeant in the Royal Air Force was also described as a journeyman wood worker whilst Margaret worked as costing clerk at a waggon works. Both bride and bridegroom gave their address as 18, Sunnydale Park, Ossett. In 1939, James Ensor’s father, Ernest James, a wood machinist was living with his wife, Martha A., at 34 Springfield, Nuneaton, Warwickshire. A third person (name redacted) was living in the household and this could have been their only child, James Ensor, who was born in Nuneaton. His mother, Martha A., died at Nuneaton in early 1943 aged 56 years. Records suggest that James and his parents had moved to Ossett sometime after September 1939, but had subsequently moved back to Nuneaton. James and his father appear to returned to live in Ossett sometime after Martha's death in early 1943 and James' marriage in March 1944. James Ensor died on war service on 23rd April 1944 just six weeks after his marriage to Margaret. Following his untimely death, she married Wilfred Norton in the summer of 1945 in the Spen Valley Registration district, that included Ossett at that time. 100 Squadron was formed in 1941 and based at RAF Waltham (Grimsby), which was initially opened as a satellite station for RAF Binbrook in November 1941. The station was officially named RAF Grimsby although the name of the nearby village Waltham was used by locals and servicemen. Throughout the war the station was under 1 Group Bomber Command. Three squadrons served at RAF Waltham (Grimsby) during its operation: 142 Squadron, 100 Squadron and 550 Squadron. The station was closed some weeks prior to the surrender of Germany and the hangars were used by No.35 MU for storage and the flying field reverted to back to agricultural use. Years later the A16 was being improved and a bypass for the village of Holton-le-Clay cut into a large proportion of the station. Currently a memorial to 100 Squadron stands near the B1 Hangar, next to the northern entrance to Holton-le-Clay. There is a memorial for 550 Squadron at the now disused station RAF North Killingholme and 142 Squadron is said to have a memorial in North Africa. On Saturday, the 22nd April 1944, Lancaster LL887 on a bombing mission to Dusseldorf took off 22:46 from RAF Waltham (Grimsby). There were 596 aircraft on this raid: 323 Lancasters, 254 Halifaxes and 19 Mosquitoes. Of the 596, 29 aircraft (or 4.9%) were lost, with 16 Halifaxes and 13 Lancasters not returning. The cause of the loss of LL887 was never established, but on the return journey, German night fighters penetrated the bomber stream, and LL887 crashed close to the Belgian-Dutch frontier. Those killed were buried at Antwerpen-Deurne, but were subsequently re-interred in the Schoonselhof Cemetery in Antwerp. Sergeant W. H. Lynch was sheltered until captured on the 6th June 1944 with the Cannaerts family in Heultje near Antwerp and interned in Camp L7, as PoW No.122. Flight Sergeant Reg Brookes, with Australian Flight Sergeant Peter Knox from the shot down 619 Squadron Lancaster ME846, was hidden in 1944, by the Sterckx family, but they evaded capture and made it back to England in September 1944. 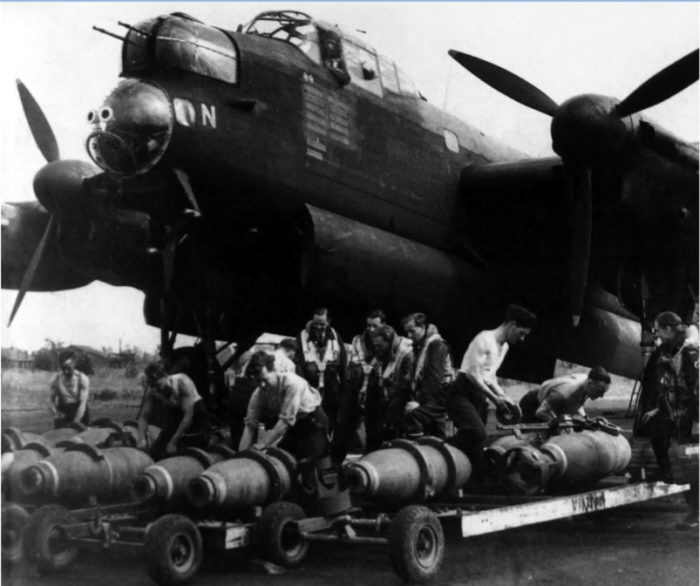 Above: Loading bombs on to a Lancaster bomber in preparation for a night bombing raid. 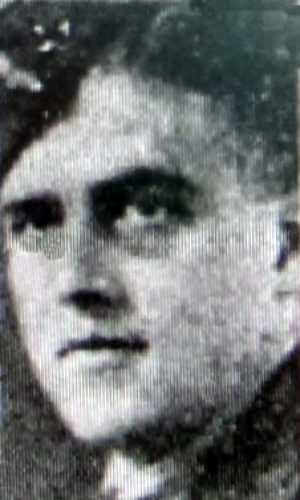 "Ossett RAF Sergeant Believed Killed- On April 23rd a private official intimation was received by Mrs. Ensor, Sunnydale Park, Ossett, that her husband Sergeant James (Jim) Ensor (22), Wireless Operator/Air Gunner, RAF, was missing from operations on the night of 22nd - 23rd April. Two of the same crew were afterwards reported to be prisoners of war, and hopes of Ensor's safety were also entertained. We regret to state, however, that information has been received that he was believed to have lost his life during the operation in question. Sergeant Ensor, who is a native of Nuneaton, near Coventry, was educated at Nuneaton Technical School and on moving to Ossett with his parents between four and five years ago, entered the employ of Messrs. Sykes at their Horbury Bridge factory. He joined up 2½ years ago, and, since completing his training has taken part in 18 operational flights over Germany. On March 11th this year, he was married at the Wesley Street Church to Miss Margaret Jelly, of 'Yardley', Sunnydale Park, Ossett, and all the members of his crew attended the wedding. They were also with him on his last flight. His mother died about a year ago, and since then his father has made a home with Mr. and Mrs. Jelly at 'Yardley'. Before joining up, Sergeant Ensor, along with his parents, attended South Ossett Parish Church." Sergeant Ensor died on the 23rd April 1944, aged 23 years and is buried at Grave 4A C 5 in the Schoonselhof Cemetery, Antwerp, Belgium. The cemetery itself is located in Wilrijk, a suburb of Antwerp. Antwerp was the seat of the Belgian Government from 17 August to 7 October 1914. Towards the end of August, the city was one of the strong positions on the Allied left flank, and by the middle of September, a position of critical importance. It was defended by fortress troops and the greater part of the Belgian Field Army and the Royal Naval Air Service used its aerodrome. On 27 September the Germans laid siege to Antwerp and during the first week of October the Royal Naval Division entered the city, playing a crucial part in its defence. On 9 October, before other British and French reinforcements could arrive, the last forts became untenable and the last defenders retired. From 10 October 1914 to the Armistice, the city was in German hands. German forces returned to Belgium in May 1940, and occupied Antwerp until its liberation by the Allies on 4 September 1944. The town and port were secured, but it was some weeks further before the approaches from the North Sea could be cleared of German resistance. 1. "Ossett Observer", Saturday, June 10th 1944.